The cellular components of blood are developed from the Hematopoietic stem cells also known as Pluripotent Stem cells or totipotent stem cells which further differentiate and mature into typical blood cells. Lymphoid stem cells/Lineage – differentiates in the Redbone marrow and then migrates to the lymphoid tissue. They form T- and B- Lymphocytes. The production of erythrocytes is called as Erythropoiesis; the leukocytes are called as Leucopoiesis and that of platelets is Thrombopoiesis. By the 3rd to 7th month of Intra-uterine life – Hematopoiesis occurs in liver and spleen. By the 7th month till birth – it starts in the bone marrow. From birth till maturity – occurs in bone marrow, spleen, and liver. In adults – Hematopoiesis occurs in the Central skeleton (Vertebrae, Sternum, Ribs, Skull, Sacrum, and pelvis), proximal ends of the long bones like Femur, Tibia, and Humerus. 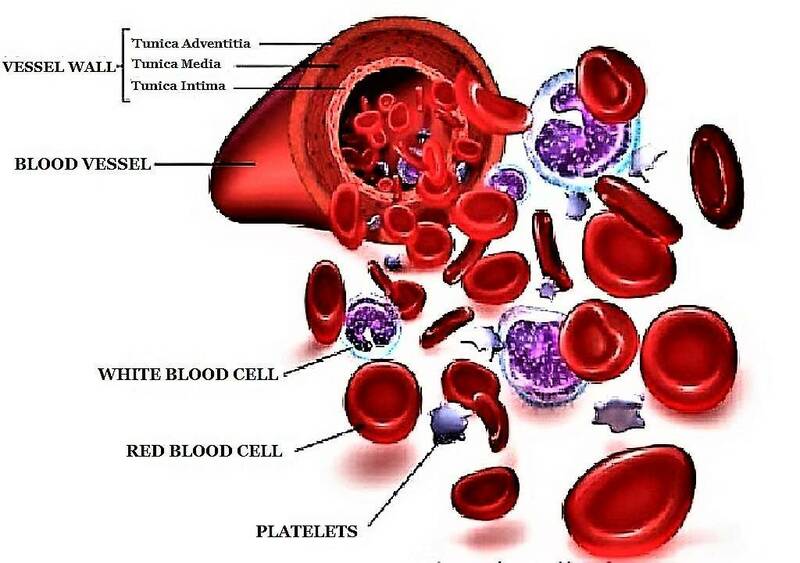 It is the process of formation, development, and maturation of Red blood cells in the bone marrow. After the gradual structural and functional maturation – the cells are released in peripheral circulation. 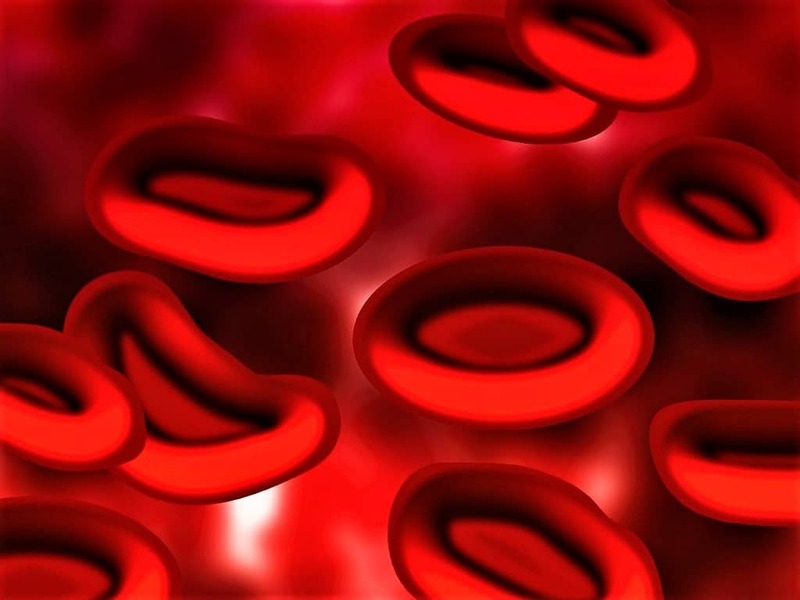 Regulation of Erythropoiesis – Erythropoietin is the hormone produced mainly by the kidneys, helps to regulate the process of Erythropoiesis so that the number of RBCs is sufficient to sustain adequate tissue oxygen levels. 1.) Proerythroblast 15-20 microns Deeply basophilic because of high RNA content. Large, Central and contains multiple Nucleoli and thick strand of chromatin are present. 2.) Early Normoblast 12-16 microns More basophilic. Gets smaller, coarse and granular chromatin are present, nucleoli may be absent. 3.) 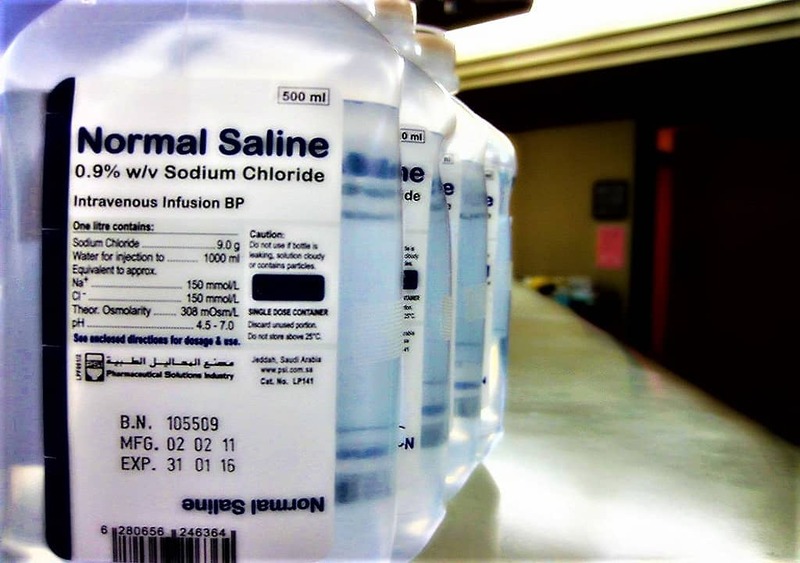 Intermediate Normoblast 10-14 microns Polychromatic – it contains mixture of basophilic RNA and Acidophilic Hemoglobin – Pinkish- blue. Nuclear chromatin – condensed, nucleoli absent. 4.) Late Normoblast 8-10 microns Acidophilic – pink color. Small and pushed to one side of the cell. 5.) Reticulocytes 7-9 microns Light pink, RNA strands are present. Degenerates. 6.) Erythrocytes 7.2-7.5 microns Pink – due to hemoglobin. Absent. Reticulocytes are called as the juvenile RBCs or Immature RBCs. Reticulocytes spend 1-2 days in the marrow than 1-2 days in circulation where it gets mature into Erythrocytes and attains biconcave shape. Stimulation by cytokines and Colony stimulating factor. Produced by Macrophages & T – lymphocytes. Activated by coming in contact with foreign organisms. 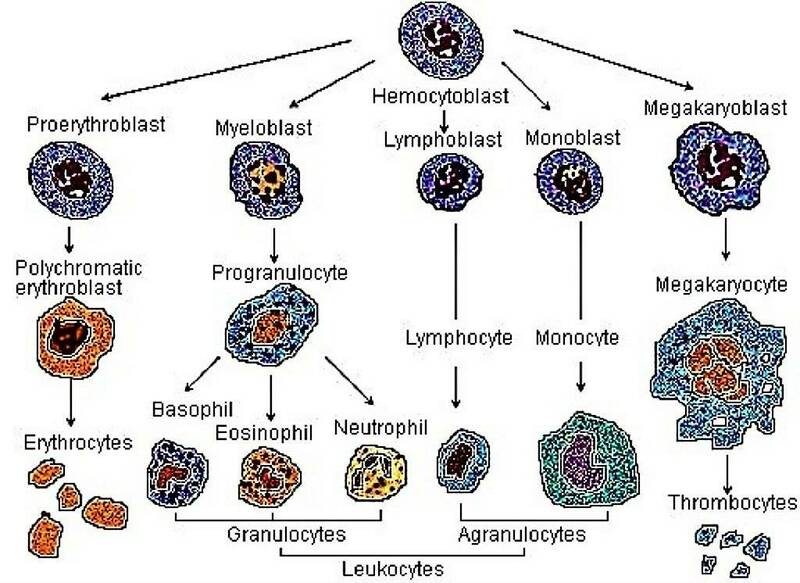 Granulopoiesis is the process of formation or production of Granulocytes that are the type of White blood cells that contains the granules in their cytoplasm, which begins at the Myeloblast and passes through the stages of a Promyelocyte, Myelocyte, Metamyelocyte and Band cells and ultimately results in the formation of 3 types of Granulocytes – Neutrophils, Eosinophils & the Basophils. 1.) Myeloblast Large, 15-20 microns Thin rim of cytoplasm, Devoid of granules Large, Round or Oval nearly filling the cell. 3.) Myelocyte Small, 12 – 18 microns Specific or Secondary granules appears in cytoplasm Round or Oval, Nucleoli are absent. 4.) Meta – Myelocyte Small, 10 – 15 microns Both primary and secondary granules. Horse shoe or Kidney shapes, Nucleoli absent. Bluish pink with Fine, Light pink granules. Pink colored with Coarse granules do not cover the nucleus. Bluish color with coarse granules, covers the nucleus. Lymphopoiesis is the process of formation or production of Lymphocytes, a type of white blood cells that lack the granules in their cytoplasm, which begins at the Lymphoblast and passes through the stage of Prolymphocyte and ultimately results in the formation of mature Lymphocytes. 1.) Lymphoblast Large, 10-20 microns Agranular & Scanty Large, Round or Oval with slightly condensed nuclear chromatin & few nucleoli. 2.) 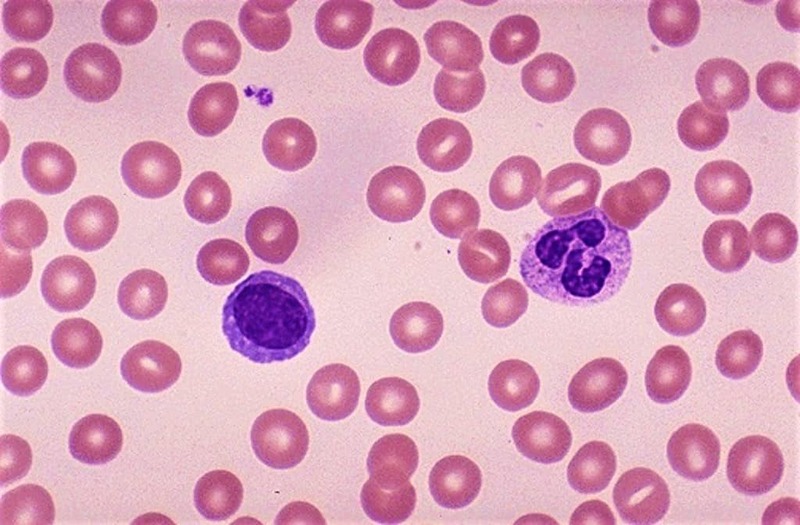 Prolymphocyte Slightly small, 10-18 microns Medium to deep homogeneous blue Centrally placed, Round or Indented which may have 0-1 nucleoli but is usually not seen. ii.) Small, 7-8 microns i.) Plentiful, colorless to light blue. ii.) Narrow edge, Light or dark blue. i.) Oval / bulging, Central, Nucleoli absent. ii.) Round/ Kidney shaped, compact chromatin. Monopoiesis or Monocytopoiesis is the process of formation of production of Monocytes, a type of White blood cells that lack the granules in their cytoplasm, which begins at the Monoblast, passes through the stage of Promonocyte and ultimately results in the formation of mature Monocytes. 1.) Monoblast Large, 12-20 microns Agranular, Light blue. Round / Oval, has fine chromatin, 1-4 nuclei, Central or eccentric. 2.) 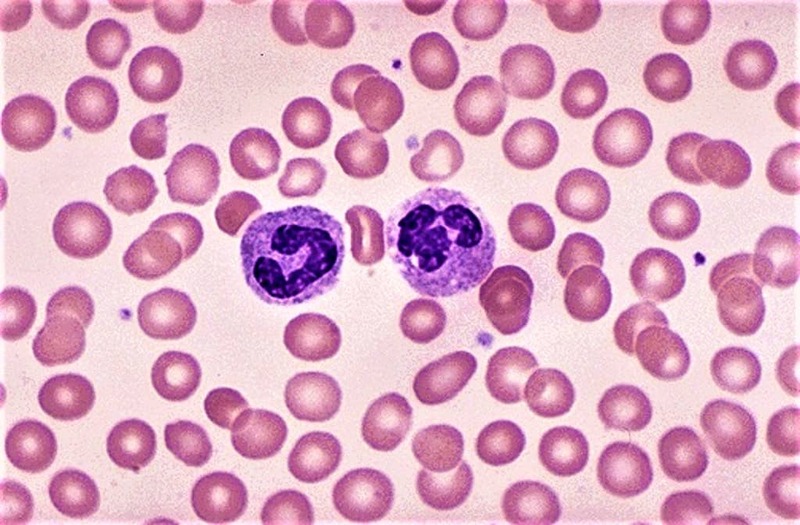 Promonocyte Large, 12-20 microns Scanty, Gray to pale blue & with rare or no granules. Sometimes Vacuoles may be present. Round, Indented nucleus with immature chromatin. 3.) Monocytes Large, 15-20 microns Dull, Gray-blue Round or Kidney shaped. 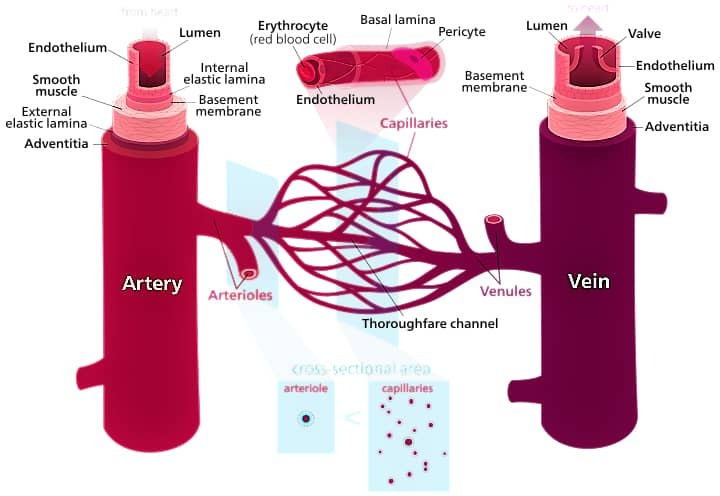 Thrombopoiesis is the formation or production of Thrombocytes or Platelets in the bone marrow which is formed by fragmentation of mature Megakaryocyte membrane projections, begins at Megakaryoblast and passes through the stages of Promegakaryocyte and then the Megakaryocytes ultimately results in the formation of mature Thrombocytes or Platelets. Hello Iam a Medical laboratory technician from South Sudan , Public Health laboratory any way the topic is clear and certifying me but you can add more. Thanks For the Advice. Soon I Will update it.